It seems that many, if not most people would just about kill to find a restaurant or bar that serves a really good hamburger and an ice cold beer for under $10. And to be able to find a place that serves the two of them for somewhere around (or even under) $5.00, well, that just seems to be beyond the scope of reality. Or is it? Read on, and you may find that such as place does actually exist, though it is far, far away from the Greater Boston area (unfortunately for those of us who call Beantown our home). Eagle Bay, NY is about as remote a village as you will find anywhere. It is between the hamlets of Old Forge and Inlet in the heart of the Adirondacks, north of Utica and Albany. While Eagle Bay has little to offer for the tourist, it does have a special little eating place. This restaurant is called The Tavern, and what a find it is. 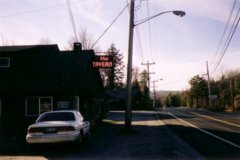 Situated on the main road through the southern Adirondacks (the wonderfully rustic Route 28), The Tavern is in a rickety old shack that has a few tables, a well-worn bar, and a pool table that has seen its better days. There is no menu at The Tavern; indeed, there is no food, other than burgers. But there is no need for anything else. For about $2.00, you can get a freshly-ground burger on a toasted bun, and the standard chips and pickle. Beers are outrageously cheap here; figure on paying a buck or two for an adult beverage. The Tavern is an instant classic in my book. There's no place quite like it. One final note: Don't be put off by the rough look to the place as you pull in the parking lot. The people there are very laid back and friendly. That old cliche, "You can't judge a book by its cover" is definitely applicable to this wonderful old Adirondack roadhouse. Copyright © 2004, Boston's Hidden Restaurants (www.hiddenboston.com).